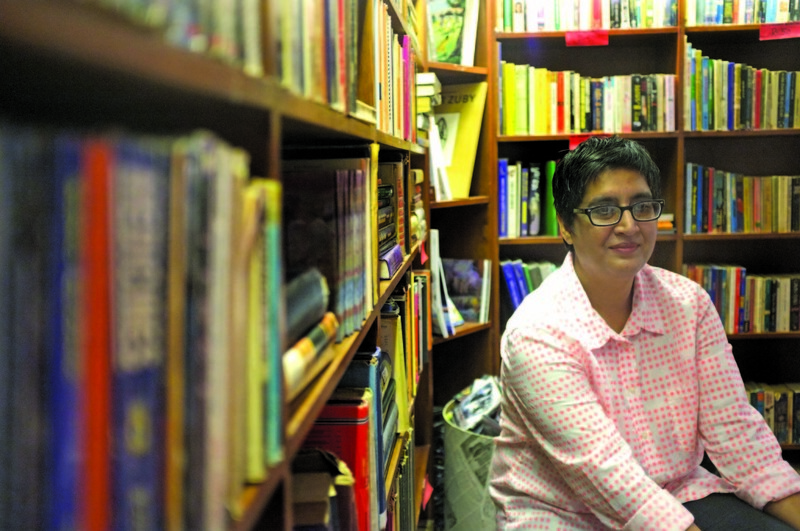 Sabeen Mahmud, owner of The Second floor (T2F) shared her experiences with HerCareer.pk that made her what she is today. The Second Floor, which is popularly known as T2F, is not only a coffee shop but is also a platform to hold seminars and panel discussions by prominent citizens in order to bring about positive change in the society. She has created a non-proﬁt organization called PeaceNiche with T2F as the ﬁrst major project. Mahmud belongs to a middle class family background. She has been a single child, raised under the supervision of her mother. Throughout her school years in Karachi Grammar School (KGS), she was seen to be more dynamic in sports and less inclined towards education. The modest young lady recalled her school days when there were times she used to reach school through public transport or by hopping on a motorcycle. After completing her O’Levels from KGS, Mahmud went to Kinnaird College in Lahore where she earned her Bachelor’s degree and returned back to Karachi. During her school life, she developed interest in computers. Unfortunately, she couldn’t get along with the teacher who taught her this course. On her mother’s suggestion, Mahmud started working as an undergraduate at Solutions Unlimited, a technology company where she achieved great graphic designing experience under the supervision of Zaheer Kidwai, who is also the co-founder of T2F. Mahmud loves to read and has a knack for discovering new things. So much so, that T2F has a library! What obstacles have you come across in your career? Whose support and/or objection did you deal with? Financial struggle has always hampered me. Initially, when T2F was born, I survived without salary for about a year. But I always had the moral support of my mother who has encouraged me with every decision. How do you manage to balance your personal and professional life, without neglecting either of them? I don’t believe in balancing work and professional life. It is the passion and love for work that drives me to T2F every day. I like the environment here and I don’t even have fixed hours to work. Work has never affected my health or given me stress. It’s an on-going process, one must enjoy work! Being a working woman, have you ever faced discrimination in your career? Not really! Since childhood, I have grown up among men, so I have eventually learned how to deal with them tactfully. Here at T2F, I have created a world where there are no politics, no discrimination or gender bias. I haven’t worked for anyone. When I started my career, my boss, Zaheer Kidvai was highly encouraging and supportive. How do you think women can utilize their talent and make a good living at the comfort of their homes? There are a lot of opportunities and job-openings nowadays; women can do so much from home. They can connect to profiles via LinkedIn and Facebook. Moreover, their work should be easily accessible through social media. For example, if you are a content writer, then start researching about content companies. So, undoubtedly there is a lot of scope of finding jobs through the internet. How can more women become entrepreneurs? Put in the best you can for the love of work and you’ll eventually move up the corporate ladder. Also, building strong relationships and a great network would help! Any successful career tips you would like to share? Women should be free to do whatever they want; they should never end up living other’s life. It’s disappointing to see women who are so passionate about learning new things but are unable to because of their family issues. You should have the courage and the strength to fight all the hurdles because people give up before even trying. There are absolutely no excuses that “I’m a woman so I can’t do it.” Mentors are always available to provide them with guidance. What message would you give to the young generation today? I don’t see that passion in the young generation these days. Be professional in whatever you do. You’ll come across tonnes of challenges, but it’s a part of life and you should know how to deal with them. Only this way, you’ll keep getting better at whatever you want to do. What are your thoughts about our project, HerCareer.pk? It’s a very good project that promotes and encourages women to work in whichever way possible. I wish the HerCareer.pk team all the best! HerCareer.pk specializes in providing onsite and work-from-home opportunities to talented Pakistani women. The portal also gives a chance for reputed companies to find the right woman candidate for their job openings. Moreover, with the help of mentors and counselors, women can make the right career choices and ease their working dilemmas. To avail either or all of the above features, register with us today!